The Old 206 will be part of my Vitality T20 Blast experience. Vitality, are assured of some massive coverage right up until the Edgbaston (Birmingham) finals day on Saturday September 15. Even though connections of our home side, The Sussex Sharks, will have to manage expectations it might just be worth sticking that date in your diaries! There is a feeling that new head coach Jason Gillespie could take his team deep into the competition. The man himself is a winner with a blue ribbon International career with Australia and he has recently taken Australia’s Big Bash with the Adelaide Strikers. 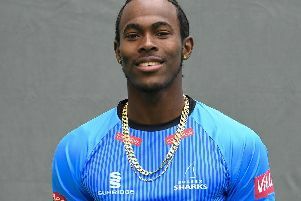 That coupled with an array of star quality running through the current squad and the hiring of Afghanistan sensation Rashid Khan there is no doubt Sussex Sharks have the tools required to win T20 matches. However, there is the ‘small’ matter of getting out of a very tough nine team Southern Group. Between July 4 through to the August 17 the team will have to play 14 intense matches. That’s seven at our beautiful home facility at Hove and seven ‘on the road’. Each match is fraught with dangers from the opposition playing a blinder, travelling and of course vagaries of the English weather. If Sussex want to be in the quarterfinal shake up come 23rd August, they will have to take that all in their stride and win eight matches along the way. The 2018 campaign gets off to a very tough start as we must make three road trips in quick succession. Momentum is a key word in any sport and whilst getting off to a flyer would be fantastic it would not be a deal breaker if Sussex were to receive a couple of early reversals. On Wednesday evening it all starts with a tough examination at Chelmsford (7pm start) facing a competitive Essex CCC team. The crowd there are partisan and right on top of the players. It should be a heady, exciting occasion for every person in the stadium. On Sunday July 8 the team then make that daunting drive to Cardiff to face Glamorgan CCC (2.30pm start). Sophia Gardens is a stunning stadium, but crowds are generally on the very low side and it’s a game that Sussex should be on the front foot. On Thursday July 12 (7pm start) many Sharks fans will head west to the impressive Ageas Bowl (Southampton) to face Royal London champions Hampshire CCC. On paper this looks to have all the hall marks of a classic encounter. The very next evening T20 Blast comes home to Hove (7pm) when we host Surrey CCC in what will be an ultra-exciting evening of big hitting, big wickets and hopefully a Sharks victory. Apart from the very first game, I hope to be at all the others and will try to bring you a flavour of the Sharks 2018 Vitality T20 Blast campaign. Of course, the old Peugeot 206 will be called into action once again. It will be making that trip to the Principality on Sunday!